We will look at trading currency futures opportunities for two markets, the US Dollar index and the Australian Dollar. We will also look at one opportunity for trading US Treasure bonds futures. Let us look at the US Treasury bonds first. Here we see a 60 minute futures trading chart for June US Treasury bonds. On the chart we can see an MACD divergence forming with the price. Prices have make a new low, while MACD made a higher low in both the moving averages and the histogram. I did not enter into a position on the first signal, as my gut instinct tells me there may be another low. I will be watching this futures contract very closely looking for the next low. I may make a long entry even if the next low is not a lower low. If you look up the daily chart for this contract you will see that prices are in the bottom area of a range. I would expect prices to rise towards the 142 to 144 area. Next, trading currency futures, we will look at the March contract for US Dollar index futures on a daily time frame. 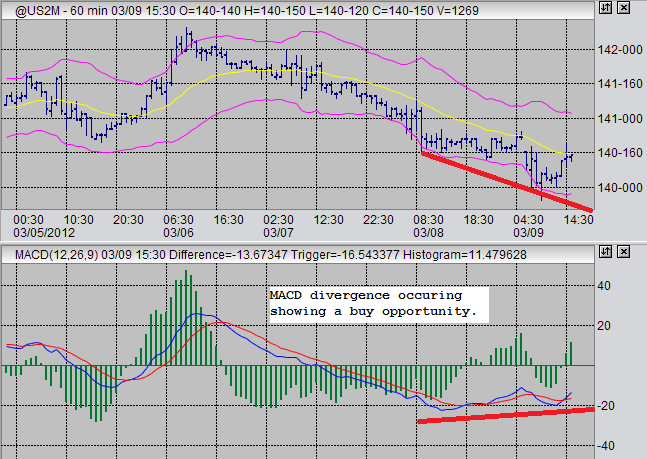 Here we have seen an MACD divergence create and follow through with a buy signal. I entered a long position on Feb 28 on the March contract (see trading blog). Since my long entry, we have witnessed a bounce back to the moving average and then a close above the last few days' highs. The bounce would have been an excellent entry opportunity as well, provided it was on the June contract. Since the March contract is about to expire, I will be looking to exit this position very soon. As soon as the 60 min chart for the March contract shows an MACD divergence top, I am out! I will then be looking for more long entries on two signals: 1 - return to the moving average on the daily chart, provided there is not MACD divergence top signal on the daily chart; 2 - MACD divergence bottoms on the 60 minute chart for the June contract. If either of these signals occur, I will strongly consider entering a new long position in June Dollar index futures. I won't expect prices to go any higher than 82-83, but we'll see... The Iranian conflict might bring surprises. Last, trading currency futures, we will look at Australian Dollar futures. Here we see a futures trading chart for the March Australian Dollar. Here, as with the US Dollar index, we see an MACD divergence has formed and followed through with a confirmation. The confirmation, as well as second short-entry opportunity, occurred as prices bounced of the moving average on #2. I entered a short position on #1 on March 1st(see trading blog). This is a chart for the March contract, but the June contract is the same. Entry on #2 should have been done on a June contract, I did not make a second entry. I will be holding this position as long as I can on a trailing stop as I expect the price to decline throughout the week, but as my position is in the March contract I will forcefully exit by Friday. I most likely won't enter another short position here, but the opportunity may present itself by retouching the moving average on the daily chart or by showing an MACD divergence top on the 60 minute chart, so long as the daily chart does not show any type of bottom. The MACD on the daily chart is currently showing the potential for a drop of a few cents more. As always, we'll see... and any trades should be accompanied with safety stops. I will be looking at June US Treasury bond futures for a long entry in the short term. I will be looking for long entry opportunities in the US Dollar Index over then next few days/weeks to make short term trades. I will also be exiting my USDX long position at a profit of at least $1.20 I will be exiting my Australian Dollar position this week with at least a $0.02 profit. The example of the US Dollar index and the Australian Dollar are good example of how MACD divergence can be used successfully as a futures trading strategy. If you want to read more about that futures trading system go here.